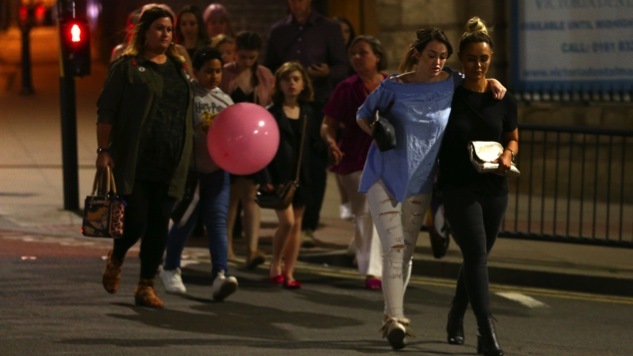 Update (8:30 a.m.): The death toll from the terrorist attack at an Ariana Grande concert in England on Monday night has now reached 22, according to CNN. Law-enforcement officials believe a suicide bomber detonated an improvised explosive device as the concert ended, and they think they know his identity. CNN is also reporting that ISIS has claimed responsibility for the attack. A suspected terrorist attack at an Ariana Grande concert in Manchester, England, has left at least 19 people dead and 50 more injured, according to local police. Eyewitness videos of a chaotic scene inside the arena began appearing on social media as the concert was nearing its end. Concertgoers can be seen screaming and running from the scene. CBS News later reported that a U.S. law-enforcement source said two explosions rocked the arena, and that the casualties included “a large number of young girls.” The CBS source said that one person was detained, but it was unclear what role, if any, that person played in the attack.